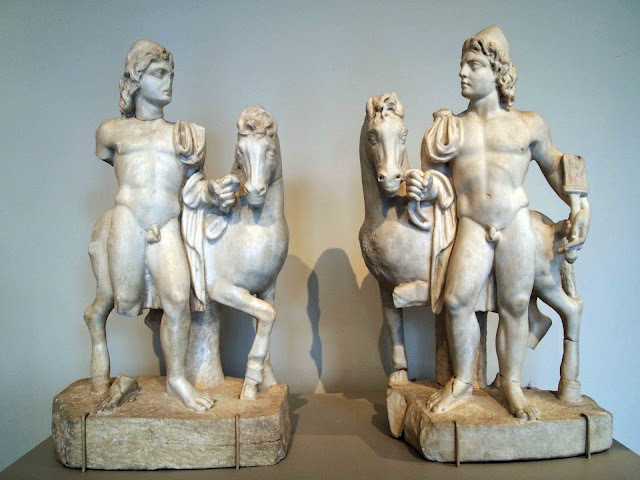 Third century AD Roman statuettes of Castor and Pollux, also known as The Twins, Dioscuri, or Gemini. In Roman and Greek mythology, Castor and Pollux were sons of Leda, though each has different fathers; Pollux was the son of Zeus, while Castor was fathered by the king of Sparta. When Castor was killed, Pollux asked Zeus to let him share his immortality with his twin; both were transformed into a constellation, Gemini.